Black and white negative showing the pump house at Lake Ontario. Two men are standing beside a piece of machinery, one of them is Herbert Pringle, manager of the Public Utilities Commission. 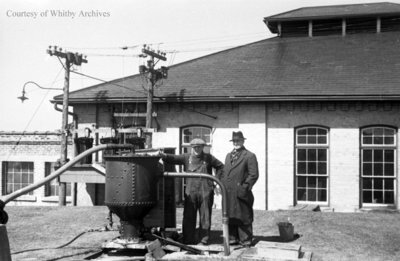 The Waterworks pump house was built in 1904 on the lakeshore between Whitby Harbour and Heydenshore Park. An additional pump house was built o the east of this building in 1959. The original building ceased to be used when a third pump house was completed in 1978. Pump House, 1941, Marjorie Ruddy. Whitby Archives A2013_040_153B.